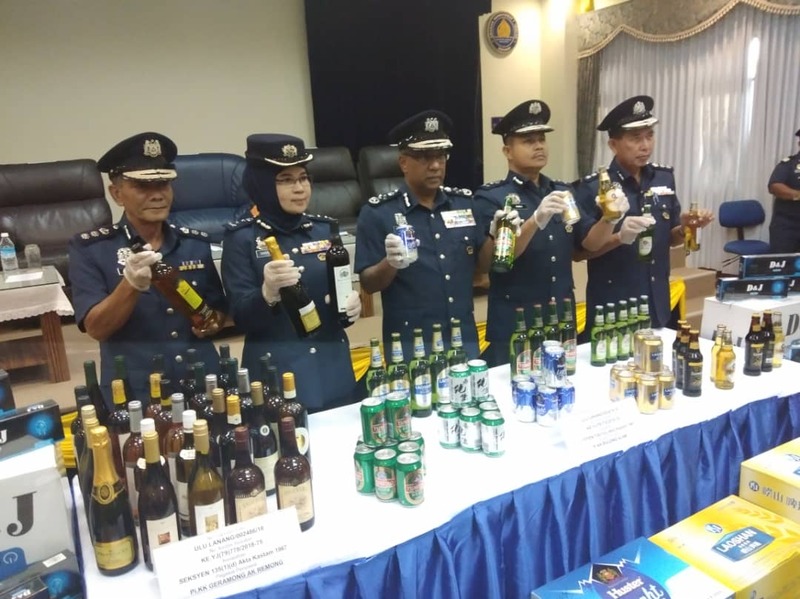 Subromaniam (center), Sharifah Halimah (second left) and others showing the confiscated alcoholic drinks. SIBU: Sarawak Customs Department successfully foiled an attempt to smuggle 45 containers of liquors and cigarettes with total value and duties amounting to RM17.477 million here. Customs Department director-general Datuk Seri Subromaniam Tholasy said this is the biggest seizure in the state this year. “For this year, I think so – this is the biggest seizure but in term of container – probably, this is the biggest in one shipment,” he revealed, when asked if this was the biggest seizure of liquor in Sarawak this year. Subromaniam further revealed that during the raid, the customs enforcement team confiscated all the 45 containers and nabbed seven crew members – all Indonesians – the youngest aged 20 years old, while the oldest at 46 years old. Adding on, he said based on the records that they got thus far, these individuals are regulars from Vietnam to Sibu. He added the crew members were remanded for 14 days to facilitate investigation. “Investigation is being carried out and we expect to charge them in court soon,” he disclosed. The tugboat and the barge carrying the 45 containers measuring 20 feet were suspected to have originated from Ho Chi Minh City, Vietnam and (the goods) suspected for distribution to local markets in Sibu and other parts of Sarawak. At the same time, the team stumbled upon a warehouse nearby the private jetty where the tugboat and barge had berthed. They seized 403 boxes of wine from the warehouse, according to Subromaniam. He said cases were being investigated under Section 135(1) (a) of Customs Act 1967 for importing prohibited goods without valid permit and Section 135(1) (d) of Customs Act 1967 for possessing forbidden goods/goods yet to be approved by Customs. “If convicted, they are liable to a fine of not less than 10 times and not more than 20 times the value of goods or imprisonment of up to three years or both,” he stressed. Asked if the owner of the warehouse was also remanded, he said only the crew members. Also present at the press conference were Sarawak Customs Department director Datin Sharifah Halimah Tuanku Taha, deputy state director (enforcement division) Rameli Ahmad, Sibu Customs Department station chief Ramlan Tahir and head of enforcement Sibu Abdul Razak Amin.